WASHINGTON, DC, November 16, 2010 (ENS) – Monday, on America Recycles Day, President Barack Obama signed a proclamation celebrating the strides the country has made in recycling generally, while spotlighting the need for greater attention to electronic waste, or e-waste. “While we can celebrate the breadth of our successes on America Recycles Day, we must also recommit to building upon this progress and to drawing attention to further developments, including the recycling of electronic products,” the President proclaimed. “The increased use of electronics and technology in our homes and society brings the challenge of protecting human health and the environment from potentially harmful effects of the improper handling and disposal of these products,” Obama proclaimed. “Currently, most discarded consumer electronics end up in our landfills or are exported abroad, creating potential health and environmental hazards and representing a lost opportunity to recover valuable resources such as rare earth minerals,” Obama wrote. Last week, the Council on Environmental Quality, the U.S. Environmental Protection Agency, and the General Services Administration formed a task force, under the President’s Executive Order on Federal Sustainability, charged with helping the federal government lead by example in responsibly managing used electronics. 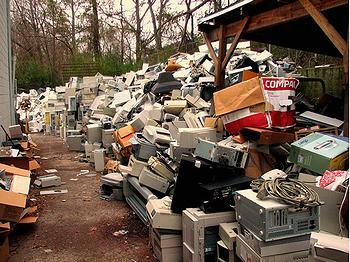 “Used electronics represent the fastest growing segment of local solid waste in our country. Far too many used electronics end up in landfills or are exported to nations where there is little capacity for safe management. Rather than benefitting from the reuse and recycling of valuable components, we see increased exposure to the toxic chemicals and other harmful substances in electronic devices,” said EPA Administrator Lisa Jackson. Electronic waste from old cell phones, computers and other devices contains toxic chemicals and heavy metals. Most of this waste is landfilled, which creates potential health and environmental hazards throughout the United States, and much of the rest is shipped to developing countries that lack the capacity to manage these wastes safely, threatening their health and environment. But the same obsolete electronic equipment contains valuable materials, such as precious metals and rare earth minerals, which can be recycled. Recycling these components conserves materials, prevents air and water pollution, and reduces greenhouse gas emissions that occur during extraction, manufacturing and processing. The EPA says that for every one million cell phones recycled, 75 pounds of gold, 772 pounds of silver, 33 pounds of palladium, and more than 35,000 pounds of copper can be recovered. “There are cost-effective and potentially profitable methods to better manage these materials and prevent health and environmental threats at home and around the world,” Jackson said. “EPA has made the handling of used electronics and e-waste one of our top priorities, and through this task force the U.S. can become the world leader in sustainable electronics management,” she said. The interagency task force will develop a national strategy for responsible electronics stewardship, including improvements to federal procedures for managing electronic products. “This strategy will also include steps to ensure electronics containing hazardous materials collected for recycling and disposal are not exported to developing nations that lack the capacity to manage the recovery and disposal of these products in ways that safeguard human health and the environment.” Obama proclaimed. In the private sector, the Certified e-Stewards Initiative, the world’s first third-party audited, accredited international certification program for electronics recyclers is getting underway with its first Leadership Council, announced in September. The Leadership Council will help guide the early development and promotion of the program to ensure responsible electronics recycling across the globe. The initiative prohibits the export of e-waste to developing countries and enjoys the support of more than 70 environmental organizations. “We are very fortunate to have this first group of ardent and expert supporters of the e-Stewards Certification volunteer to help advise and shape this program to not only be the most principled electronics recycling certification in existence but the most practical and useful one as well,” said Jim Puckett, executive director of the nonprofit Basel Action Network. The Leadership Council consists of representatives of five U.S. e-Recyclers: Capstone Wireless of Texas, CloudBlue of Ohio, Electronic Recyclers International of California, Surplus Exchange of Missouri, and WeRecycle! of New York. Philips Services Corp., with e-recycling collection facilities across the United States, represents e-waste collectors. Samsung and Wells Fargo, both enrolled in the e-Stewards Enterprise program, represent electronics manufacturers and corporations that generate e-waste. A representative of the Natural Resources Defense Council and two government representatives round out the council.